We're working with La Poste, the national french postal service. Only 2-5 days to most of european countries. Order with friends to share postal fees! 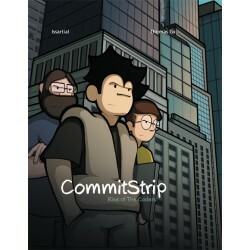 A doubt, a question, don't hesitate one second : shop@commitstrip.com ! We find solutions for everything! We are using Paypal, simple and secured ! Great products to support a great blog! In buying our books, teeshirts and posters, you not only get a superb product, but you also support the blog, allowing us to continue to publish one strip per day! Et for this, we'll love you forever, bro.